The Wall Street Journal reports that Google Music will launch in the next two weeks—regardless of whether or not Google has inked deals with the four major record label giants. That's a ballsy move, Google. It seems Google is betting that it can leverage its status and huge base of users to bully some of the most infamous bullies out there: the recording industry. Google Music has been stuck in a closed Beta because Google hasn't been able to settle on deals with the four major record labels. Sony Music Entertainment is holding out, citing concerns that Google isn't doing enough to curb piracy on YouTube and in apps on Google's Android OS. Warner Music apparently thinks it's getting low-balled by Google. While Google is offering huge up-front licensing deals to the labels, Warner wants some love on the back-end as well—Google Music's storage locker is free and doesn't generate any revenue whereas Apple's comparable service, iTunes Match, costs $25 per year. 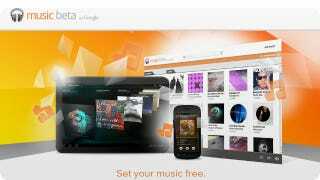 Google says that MP3 downloads from Google Music will be enough to cover the difference.